Whose heart doesn’t ache with a sense of possibility when sallynge on the sea? 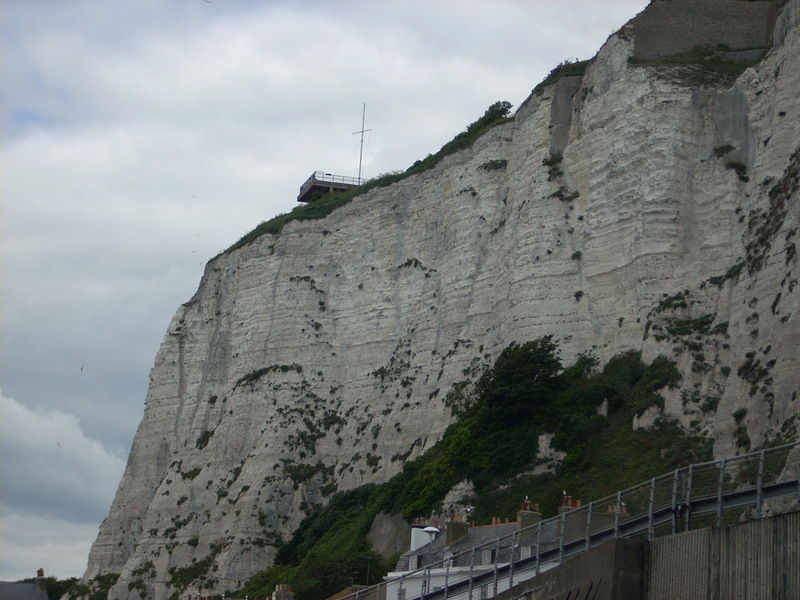 Here in Dover, below the signature white cliffs, it is easy to imagine Arthur’s company finally setting forth across the English channel to begin their great journey. shotte from the banks [in] many grete caryekis and many shyppes of forestnge with coggis and galyes spynnesse full noble with galeyes & galyottys rowying with many ores. And thus they strekyn forth in to the stremys many sadde [valiant] hunderthes. a grete multitude of shyppes, galeyes, Coggis, and dromoundes sallynge on the sea. In either version of the text, the image evoked is of a massive and varied fleet of ships setting out across the sea, already a kind of conquest of European maritime technology. Now that the Eurostar train connects London and Paris, the Dover ferry terminal is quieter, with relatively few foot passengers. We board a single bus that takes us dockside, and from there we literally lug our luggage up a series of steep ramps to the passenger decks. The ship fills up once the bus groups and auto passengers come on board, ordering food, snapping photos. With a steady breeze, flags brightly snap out on deck and diverse languages pepper the air. I’m sailing on Sea France, so the language transition is already happening. A little nervous about my traveler’s French and the 500 km drive to Rennes that awaits me once I pick up my rental car in Calais, I am nonetheless ready to order a croissant with confidence. Reluctant as I was to leave Sandwich, I’m thankful to be underway and for the long, mid-summer day: I won’t arrive at Calais until late in the afternoon and while I have Malory’s text with me, I don’t have a modern road map. Setting such practicalities aside, my thoughts turn to my son Nico, who turns 15 today–July 11th. I miss being with him on his birthday, and look forward to celebrating when our family meets up in Rennes next week. Leaving the comfort of my linguistic alma mater, the spirit of of an epic embarkation wells up in me as the ship’s horn blasts and we set forth across the channel. I am really doing this–following the itinerary of the Roman War campaign. 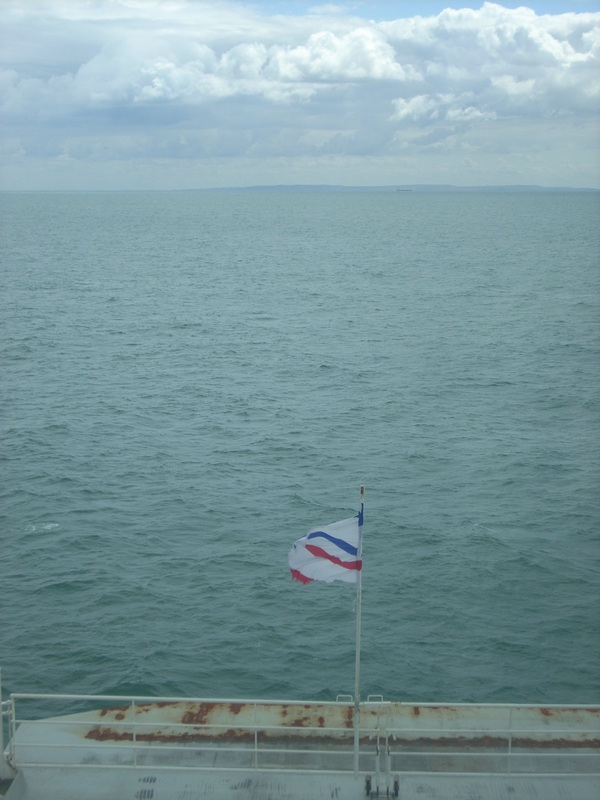 I can see Normandy, distant on the horizon across the channel, a sliver of deep steel-blue terrain, contrasting with the green aquamarine of the channel waters on this overcast day. The 2 ½ hour channel-crossing seems an achievable natural boundary to traverse, physically or imaginatively– if your goals are lofty enough.